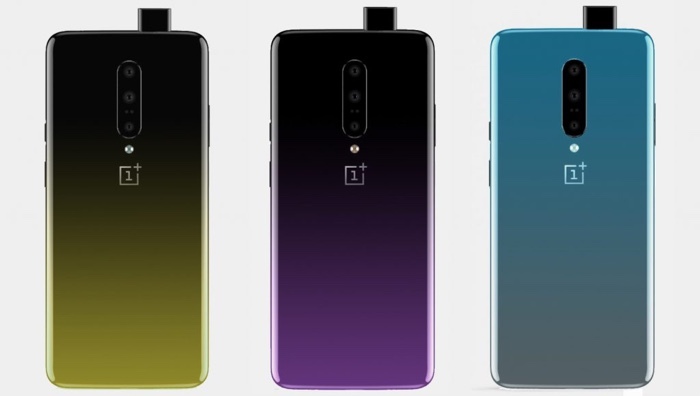 We recently heard some specifications on the new OnePlus 7 and also saw a photo of the frontt of the handset, now some press renders have been leaked. The previous leak revealed that the device would come with a pop up front facing camera for Selfies, the latest pictures have confirmed that the device will come with a triple rear camera setup. The handset will come in three colors, Black Yellow, Black Purple and Cyan Grey and the device is rumored to feature a Qualcomm Snapdragon 855 mobile processor and 8GB of RAM and 128GB of storage as standard. There will also be another version with 12GB of RAM and 256GB of storage, it will feature a 6.4 inch AMOLED display and will come with a 4000 mAh battery. The front popup cameras will have a 16 megapixel sensor, the three rear cameras will be made up of one 48 megapixel camera, one 20 megapixel camera and one 5 megapixel camera.